There is a lot of cooking in my kitchen for other people - steak for my husband, a whole series for my daughter, BBQ for my in-laws. This Baked Falafel is just for me. 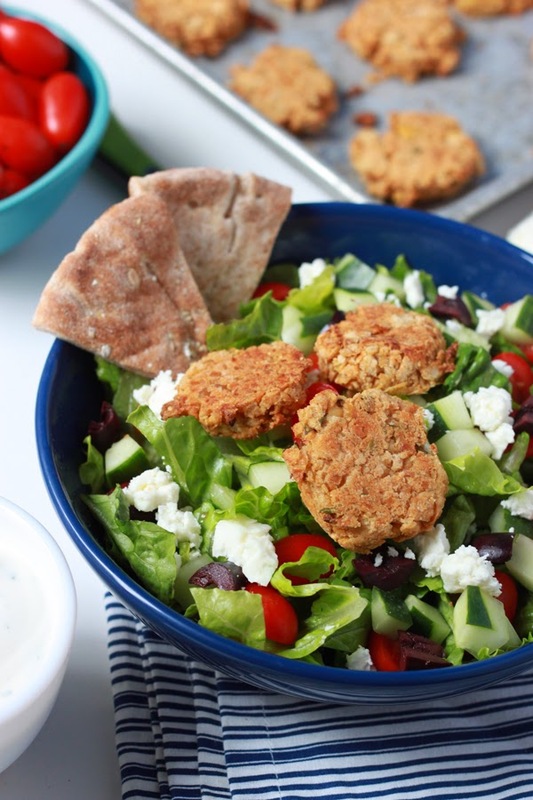 I could eat meatless hearty salads for every meal and I love greek food. The hubby will pass on tomatoes and olives and our little darling is only really interested in strawberries and cheese toast these days. Luckily - I'm the only cook in the house and everyone just has to deal with my whims. Just kidding, being a wife and mom just means I need meals that 1. I love and 2. I can adapt for my sweet finicky family. This Baked Falafel is good like that. 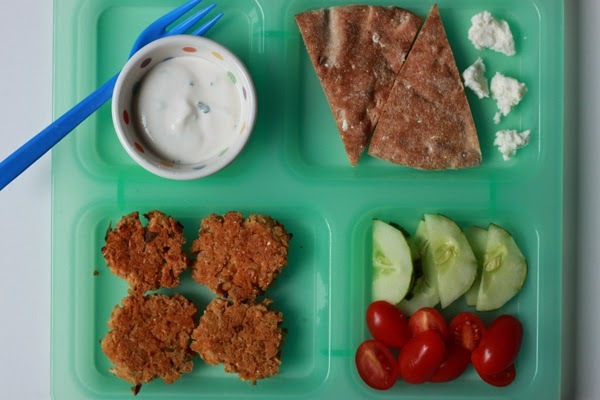 My husband will eat these in a pita pocket without the tomatoes and olives and with very little yogurt sauce. Ella will have her sauce on the side, actually she'll have everything separate, please. Me? I love to eat these guys on a big bed of lettuce with lots of feta, lots of ripe tomatoes, and lots of stinky olives. 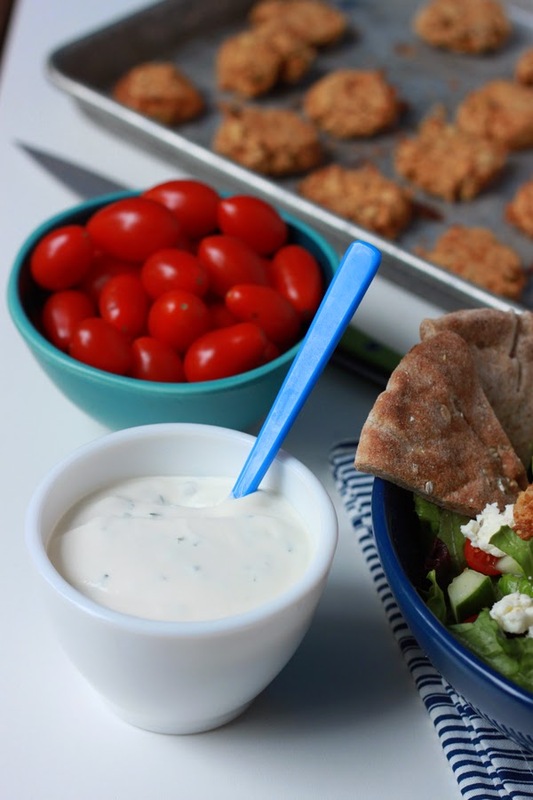 The falafel and Simple Yogurt dressing also make a pretty hearty appetizer with some sliced cucumbers. 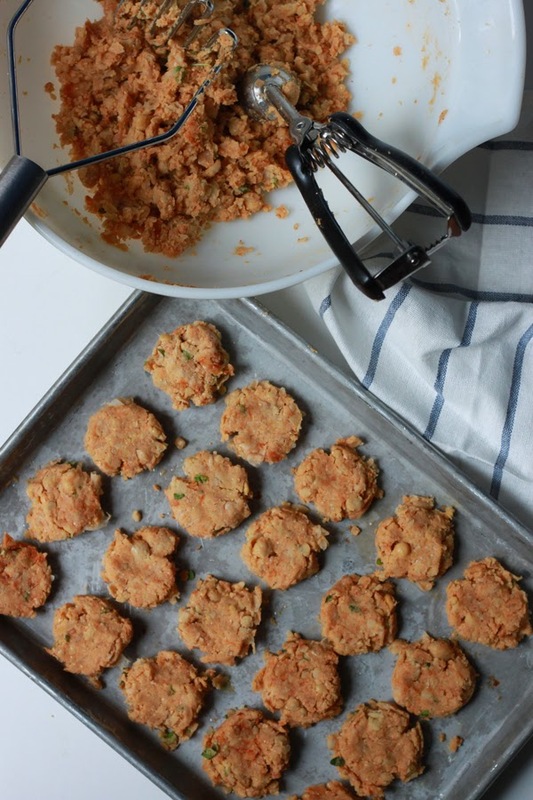 Like most of the recipes I share here - these Baked Falafel are adaptable and forgiving. Out of cornmeal? Use all-purpose flour. Hate mint? Just chop up some parsley. The yogurt sauce can handle some red wine vinegar instead of the lemon (because 9 times out of 10 - I forgot to buy the lemon). 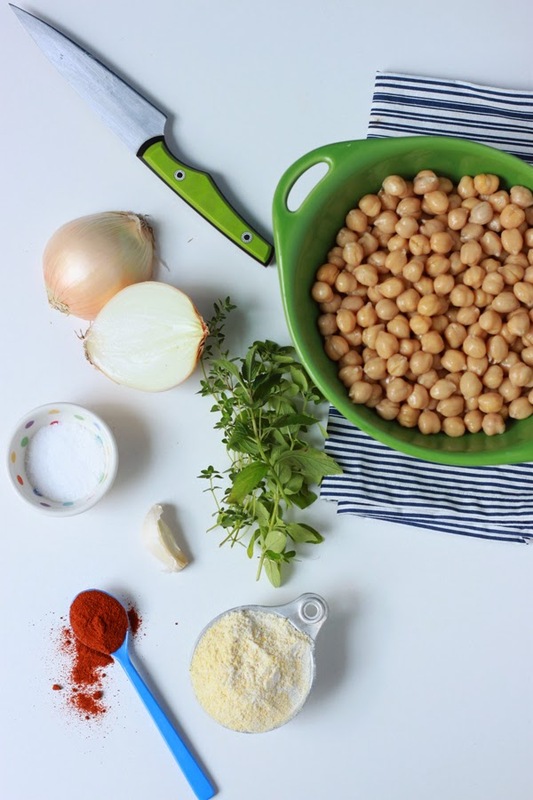 Mash together the chickpeas, onion, garlic, cornmeal, herbs, paprika and salt with a potato masher in a large bowl until most of the chickpeas are smashed and the mixture holds together when pressed. You can also pulse the mixture in a food processor 10-15 times until the mixture resembles coarse crumbs and also holds together when pressed. Coat a baking sheet with 2 tablespoons olive oil. Scoop the chickpea mixture into 2 tablespoon sized balls (I like a small fisher for this) and flatten slightly. Bake for 12 minutes, flip and bake for another 12 to 15 minutes or until crisp. 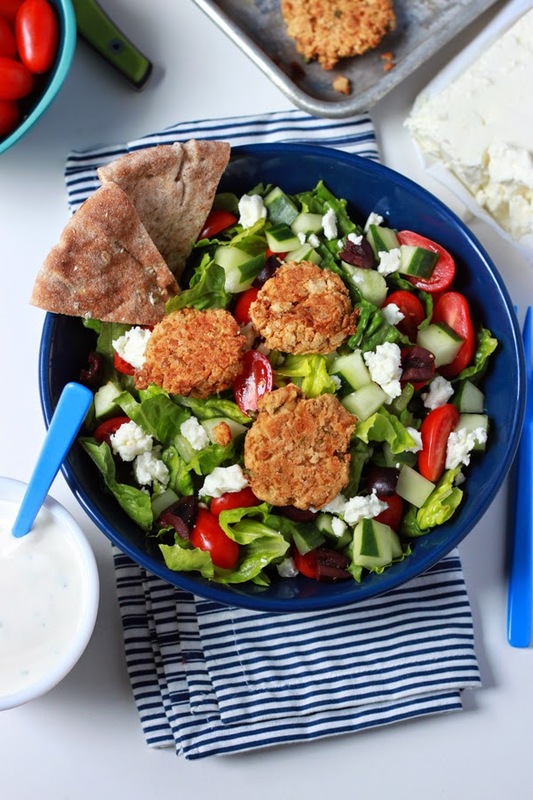 Serve with Simple Yogurt Dressing, pita bread, feta cheese, tomatoes, cucumbers, and olives. Mix together yogurt, lemon juice, herbs, and salt. Let the mixture sit for at least 30 minutes before serving. Psst. This is how I set up the components of a greek salad for Ella. She is 1000% guaranteed to eat the bread, yogurt sauce, and cucumbers. Every once in a great while she will eat the tomatoes and the feta too - so I keep trying.